Astronaut Jones, originally uploaded by justinpward. 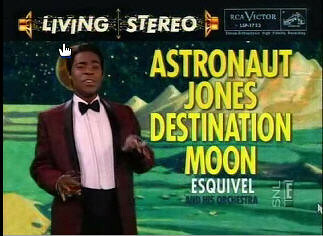 One of my favorite Saturday Night Live skits of recent (as in, the past few years) features Tracy Morgan as "Astronaut Jones," a smooth Frank Sinatra-type character starring in a 1950's-ish sci-fi show. He's an astronaut, he's taking a rocket to the moon (and other locales), and he's got one of the best one-liners in SNL history. Here's a link to a video clip of one of the skits, or you can stream two of them here.